Messier 14 (M14, NGC 6402) is a slightly elliptically shaped stellar swarm, about 100 light years across and about 30,000 light years away; older determinations have given values between 64,000 ly (Shapley) and 23,000 (Mallas/Kreimer) to 24,000 ly (Glyn Jones, Kinman, Becvar); the Sky Catalogue 2000.0 had 38,000 ly. Shapley assigned it an ellipticity of 9, extended in position angle 110 deg. While its bright main about only about 3 arc minutes in angular diameter, the cluster's outlayers reach out to a total apparent diameter of 11.7 arc min. It lacks a dense central condensation (Burnham), as its concentration class VIII indicates. Its apparent visual brightness of 7.6 visual magnitudes corresponds to an absolute magnitude of -9.12, or to a luminosity about 400,000 times that of our sun - so while, because of its greater distance, it is apparently dimmer than the two other great Ophiuchus clusters, M10 and M12, it is intrinsically much more luminous. The brightest stars of M14 are of about visual mag 14.0, and its horizontal branch giant stars at mag 17.2. Helen B. Sawyer Hogg gives the average magnitude of the 25 brightest member stars as 15.44 and its overall spectral type as G0; modern determinations have put it at F4. A color-magnitude (or Hertzsprung-Russell) diagram of this cluster is found in Smith Kogan et.al. (1974). M14 contains the considerably large number of over 70 variables, many of them W Virginis stars (Population II Cepheids; Demers and Wehlau 1971). In 1938, a nova appeared in M14, which however was not discovered before 1964, when Amelia Wehlau of the University of Western Ontario surveyed a collection of photographic plates taken by Helen Sawyer Hogg between 1932 and 1963 (Hogg and Wehlau, 1964). This nova was visible on 8 plates, taken between June 21-28, 1938, as a 16th mag star - this faintness explains, at least in part, why it had not been discovered earlier. Mrs. Hogg has estimated that this corresponds to an absolute magnitude of -1.5 (a modern check yields -0.7), but thought that at its maximum, it should have been as bright as mag 9.2, or absolute magnitude -7.5 (modern check), or almost 5 magnitudes brighter than the brightest cluster members! This was the second known nova in a globular cluster after that of 1860 in M80, T Scorpii, and the first one ever photographed. In 1983, the 4-m telescope of CTIO and the 3.9-m Anglo-Australian Telescope were used in attempt to look for a remnant of the nova (Shara et.al. 1986). In 1991, astronomers used the Hubble Space Telescope to observe the field around this nova in M14, but could not find the star or a nebulous remnant (Margon et.al. 1991). In 1997, a carbon star (a star with strong carbon lines in its spectrum) was discovered in M14 (Cote et.al., 1997); this star has probably lost its outer layers in close encounters with other cluster members so that the carbon-enriched former core reaches up to the surface. 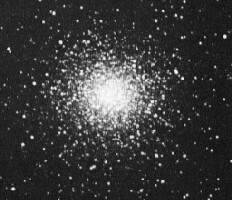 Globular cluster M14 is one of the original discoveries of Charles Messier who cataloged it on June 1, 1764 and described it as a round nebula without stars. It was first resolved into stars by William Herschel in 1783. 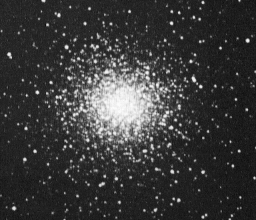 Globular cluster M14 was the first CCD image taken, according to TheSky advertising. M14 lies a bit isolated, or distant from brighter stars. Perhaps it is easiest found from M10: Go 0.8 deg North and 10 deg East from that cluster. It is also only about 0.4 deg North, but about 21 deg East of Delta Ophiuchi, or slightly east and about 1/3 of the line from Beta to Eta Ophiuchi. It is also 2deg N, 3deg E of 4.5-mag 47 Ophiuchi (HR 6493), which is 1deg S, 7deg E of M10. Delta or 1 Ophiuchi, called Yed Prior, is a multiple of about mag 2.7 and primary spectrum M1 III, at about 160 light years distance. Beta or 60 Ophiuchi, called Cheleb (or Cebalrai, or Kelb Altai) is an orange giant of spectral type K1 III or K2 III and mag 2.9, at a distance of about 125 ly. Eta or 35 Ophiuchi (Sabik) is a binary of two A2 stars, mag 3.2 and mag 3.5, with an orbital period of about 85 years, separated about 0.4"-0.6", at about 70 ly distance. Because of its considerable distance and the resulting faintness of its stars, M14 is not as easily resolvable as the nearer globular clusters. In smaller telescopes, it appears more like an elliptical galaxy at first glance, fainting out quite rapidly at the edges from the bright, almost round central hazy disk. Suspicion of some graininess can be noticed in 4-inch scopes under good condition. An 8-inch may just show a trace of resolution and some grany texture, and only larger scopes can resolve at least its outer parts. Near and just East of the above-mentioned star 47 Ophiuchi (HR 6493) is the faint (9.2-mag) globular cluster NGC 6366, 2deg S and 2.5deg W of M14.